The T.J. “Tony” Saprito Fishing Pier will be temporary closed to the public from 8 a.m. to 4 p.m. Friday, April 5, while it undergoes a comprehensive inspection, the City of Sarasota has announced. To ensure public safety, crews will be examining the integrity of the structure, which was built in 1979, a news release explains. The structure was partially rebuilt and rehabilitated in 2007, the release adds. 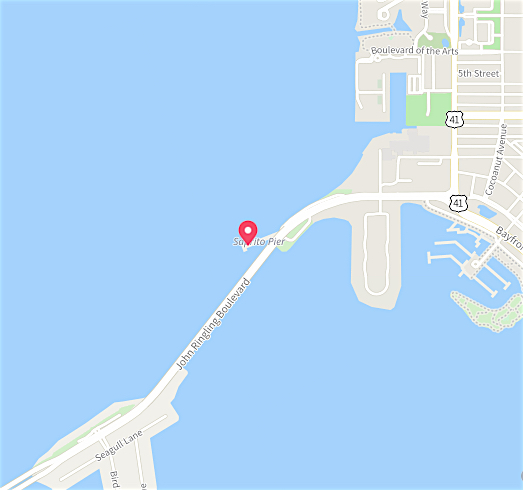 “The popular and scenic fishing pier is located under the John Ringling Causeway Bridge,” the release notes; it is adjacent to Ernest “Doc” and Eloise Werlin Park. The park and nearby Hart’s Landing bait, tackle and snack shop will remain open while the work at the pier is completed, the release says.